Just when you thought you might be done with vegetable gardening for the summer, here’s something to consider: growing vegetables for the winter. If you’ve never grown winter crops but want to try, hardy greens would be a good place to begin because you can plant them now. And you still have a couple of months to construct a cover that will protect them when the rains and colder weather arrive. 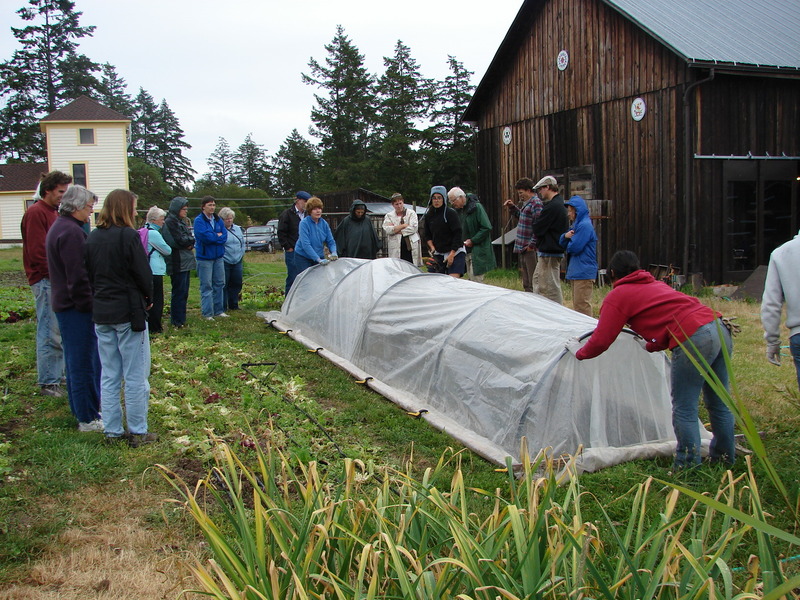 Last month, WSU San Juan County Extension offered a workshop in Friday Harbor titled “Winter Fresh! Growing Your Own Produce in the Off Season.” Here are some workshop highlights on what to plant and how to protect it. Carol Miles, Vegetable Extension Specialist at the WSU Mt. Vernon Research and Extension Center, distributed copies of Territorial Seed Company’s winter planting schedule. Greens listed for August and September planting are: arugula, corn salad, endive and escarole, lettuce, mustard greens and spinach. While all of these greens can be planted directly in the ground, Carol suggested seeding them in flats and then transplanting into the garden to give them a stronger start. Joel Thorson of Thousand Flower Farm, Waldron Island recommended catalogs from Territorial, Johnny’s, Stokes and Fedco for seeds and cultural information on hardy greens; for more advice on growing winter produce, he recommended Linda Gilkeson’s Year-Around Harvest: Winter Gardening on the Coast (order at http://www.saltspringseeds.com/catalog/books.cfm) and Binda Colebrook’s Winter Gardening in the Maritime Northwest: Cool-Season Crops for the Year-Round Gardener. Tom Schultz, WSU San Juan County Extension Director, recommended Eliot Coleman’s Winter Harvest Handbook: Four Season Vegetable Production for the 21st Century. Once you’ve decided what to plant, the next task is designing a cover. While both Tom and Joel have for years successfully grown hardy greens and other winter vegetables outdoors without cover, lately both have begun using low tunnels over greens for the protection they provide from cold and rain as well snow. One challenge in using any kind of garden structure, however, is constructing one that will withstand winter wind and weather. Addressing the winter weather challenge, Susan and Peter Corning welcomed the workshop to their Synergy Farm on San Juan (http://www.synergyfarm.com/default.asp) and demonstrated the simple but ingenious wind-proof low-tunnel they’ve perfected to withstand the winds that batter their farm in winter. • Three 3-foot high rebar reinforced PVC hoops (a friend bends rebar and they thread flexible black PVC pipe over it): pound them into the ground at each end of the bed and in the middle. • Two 3-foot high PVC hoops and four rebar stakes: pound the stakes into the ground between the middle and end hoops and slip the PVC hoop ends over them. • One 10×30 foot piece of greenhouse grade plastic: drape it over the hoops leaving about a foot overhanging each side and 5 feet overhanging each end. • Two 20 ft 2x4s: lay them along the long sides of the plastic and roll the plastic around them several times. • Twelve spring clamps: use them to clip the plastic to the 2x4s at regular intervals. • Two 6 ft 2x4s: lay them along the ends, roll the plastic around them several times and lay them on top of the side 2x4s. • Four 6” ratchet clamps: use them to attach the end 2x4s to the side 2x4s. As Susan and Peter explained, the rebar-reinforced hoops and the 2x4s joined by clamps are keys to creating a structure that withstands wind. Other advantages of this structure are that it’s easily vented by opening the ends on calm, sunny days and easily dismantled for harvesting or replanting. If you try growing hardy greens under cover this winter and develop a taste for them, maybe next year you can find some time and space in July to plant other hardy winter vegetables. Rutabaga, parsnips, celery root, beets and carrots all taste great with greens and thrive without cover.